The majority of this is from Topshop (been browsing the website a tad too much!). The only things which aren't from Topshop are the belt (Hugo Boss), dip-dye top and bag (Urban Outfitters). I was planning on checking out the Topshop sale items but wandered onto the rest of the website as well (woops). Love this dip-dye jumper, I was a bit unsure at first but every time I look at it I like it more! I was originally looking for a bright coral knit or something along those lines, but fell in love with these two Topshop ones. The dip-dye top is from Mango, I saw it in the shop a while ago but they only had it in Large, which I did try on but it was just to big :(. It is also sold out in all but XL online so if anyone wants to sell me a small I'd be very happy! 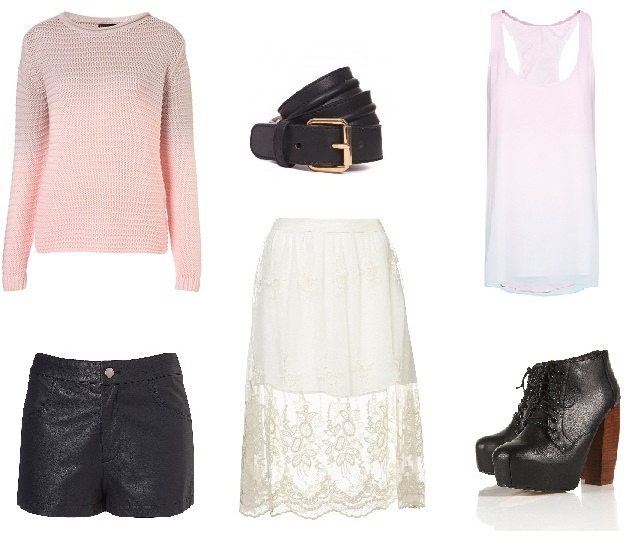 I have wanted leather shorts for a while, I like these Topshop ones but may look around for some cheaper versions. I have seen some good H&M ones on peoples blogs so might check there. The skirt really caught my eye but don't know what it would look like in real life. I would definitely have to try this on, it's one of those things which could possibly look a bit frumpy. LOVE these boots, don't know what else I can say really, just want to own them! This Urban Outfitters bag seems pretty ideal, I have been looking for an appropriate small(ish) black bag to replace my really really really old Topshop heart shaped one for a while and this seems to fit the bill. It looks expensive (from this image, I haven't seen it in person), and also converts to a clutch which is always a plus! (it has an over the shoulder strap which you can see on the other photo's). I've wanted leopard print shorts/skirt ever since seeing someone wearing them with a black top in the 'street style' section of a magazine, sounds simple but it really caught my eye and I loved the outfit! I did buy a leopard skirt before though and ended up taking it back because I didn't think it was very versatile/thought it might look a bit cheap but I've definitely changed my mind! Collar tips - I've wanted some for a while and these are my favourites although they are quite expensive so I might check Ebay. I just think they'll be perfect for updating a few different pieces of clothing without splashing out too much (well, if I don't get these ones). These shorts caught my eye, I like the colour and thought they looked expensive but my boyfriend didn't seem too keen, man repellers? Or just plain ugly? Not that I tend to take his advice anyway, dread to think what I'd be wearing if I did! Never really considered getting a black jumper but I really like the way this has a wide(?) knit, I imagine it would look great with a white tee underneath, nice jewellery and a pop of bright nail varnish. I've wanted this hand chain for aages, but again, may turn to Ebay to look for something similar because I can't bear to splash out so much on it in these tough times! I am so in love with most of these items! The white lace skirt is lovely! I'm eyeing off that tye dye jumper too! Love it!